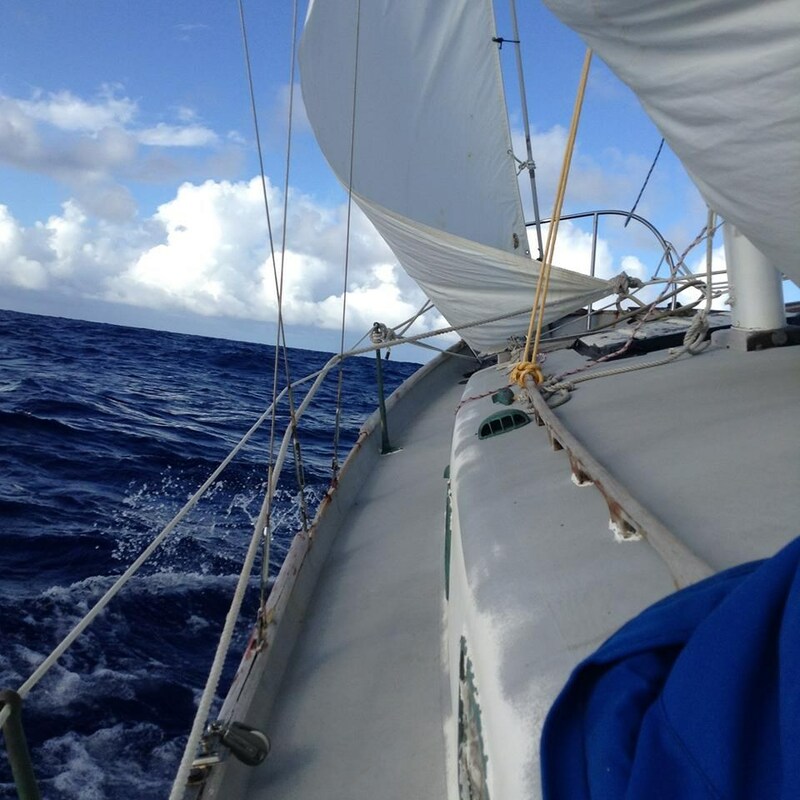 Rimas has survived yet another passage, and lost yet another boat. Rimas was most recently in Saipan. According to Jean Mondeau, he left there in mid-December, supposedly heading for Guam. 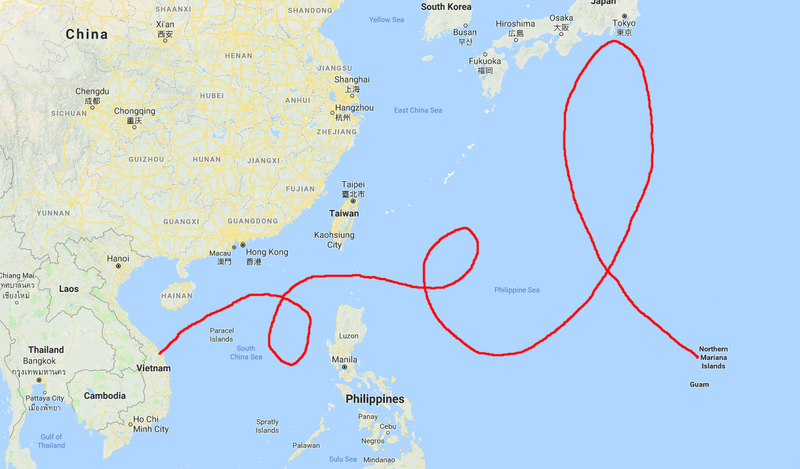 Having a destination implies a certain ability to go in a direction of one’s choosing, however, and instead of a 130-mile trip southwest, he wound up 2,200 miles to the west, off the coast of Vietnam. He had no tracker for this portion of his trip, so we can only guess at what the actual route looked like. On February 4, 2018, Rimas posted on Facebook that he was docking at Da Nang (I assume that’s what he meant) after having traveled as far north as Japan. 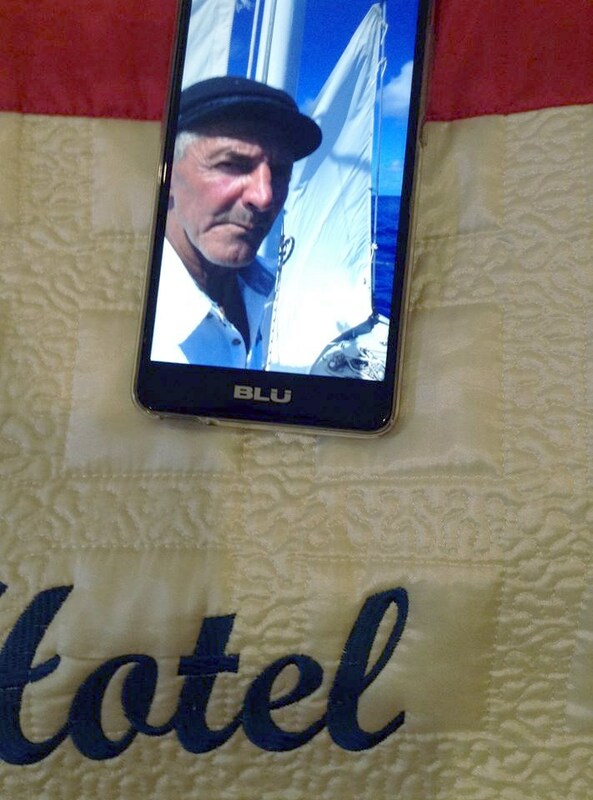 Sailing around the world will be continued when I am back to America. My boat was hit by a storm near Yokohama Japan and now i’m docking at da bang city in Vietnam at Tiensa hotel. Later reports on the same day implied that the “docking” either referred to his rescue boat or was metaphorical, since his boat was sunk. 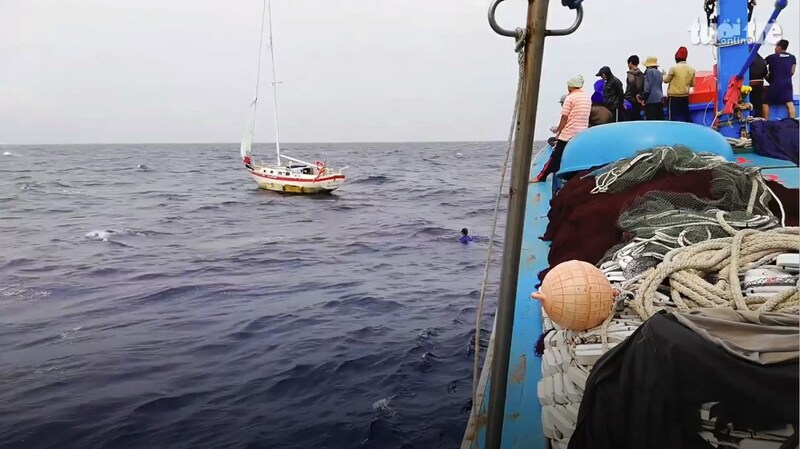 Cosmology aside, video of his rescue by Vietnamese fisherman shows Mimsy floating just fine, so once again, Rimas appears to be an unreliable narrator. I’m not sure whether we’re supposed to believe that Mimsy was scuttled or just abandoned or what, but it appears that he’s boatless once again. 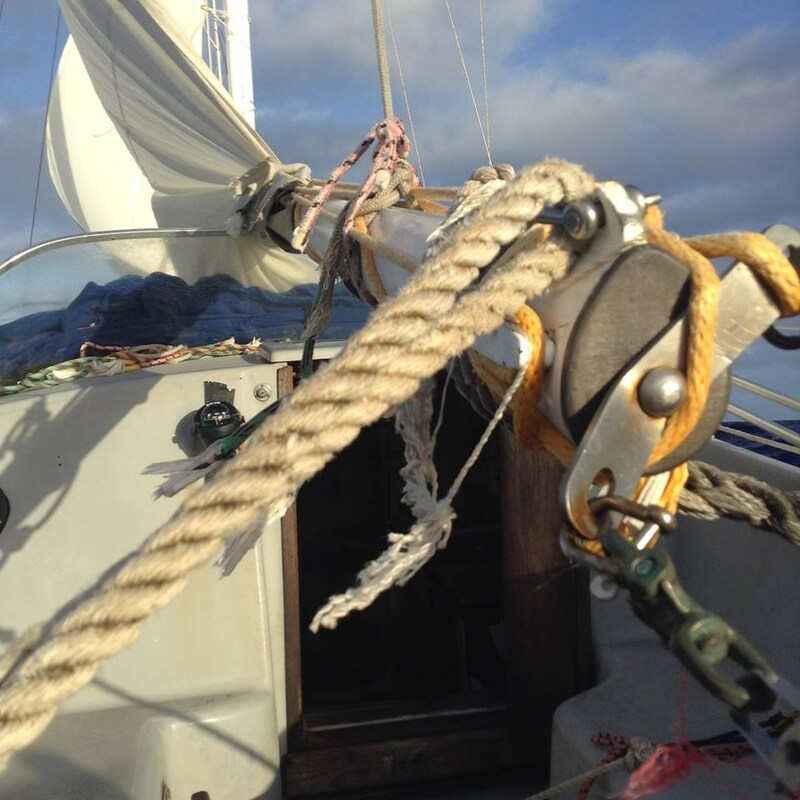 He’s back on Facebook, schooling us with images of rigging and sail trim. Among his other innovations, he’s also re-inventing the selfie. He claims that he’s not done. Will the drift-a-thon continue? He’s survived a lot more than most people expected, and he’s put thousands of miles under his keel at a pace that would drive a sentient being insane, but for the sake of the world’s search and rescue community, I hope that no one buys him a fourth boat. Maybe it’s just the gambler’s fallacy, but I’ve got to believe that there’s an upper limit of luck. Hey Kjango. Good to see you. Thanks for reading my boat log. Thanks for posting this. Mimsy was our family boat in the Sacramento Delta in the late 1960’s. I was so shocked to discover the whole Rimus debacle and followed over the last year the disappearances and reappearances. Mimsy was so much fun for us. What an insane end. Wow, I can’t believe you found our boat log. Sorry to be the bearer of bad news about your previous boat. Hopefully she floated to Vietnam and is getting some use from the locals.